FergWorld : Articles : Copter! The Schweizer 300CB. The pilot sits on the right side. "Fixed wing? I rode in a Cessna twice," says Andrew Chan, helicopter CFI, as we accelerate to 55 knots IAS and climb out at 500 fpm. The grass under my feet rolls forward towards us on an invisible conveyor belt; the bubble canopy makes the experience much like an IMAX movie. "Maybe three times," Andrew muses. "I wonder what it's like to land at 60 miles per hour or whatever speed you guys land at." We are flying in a Schweizer 300CB, a piston-powered training helicopter. 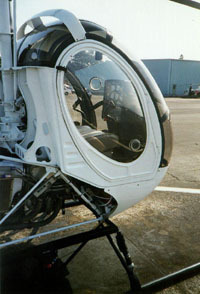 I'm in Titusville, Florida, at Helicopter Adventures, Inc. HAI is a well-known and respected flight school. They train helicopter pilots, and that's all they do. Amongst most rotor-only pilots, there's a prevailing attitude of ambivalence when airplanes are mentioned. The parlance for all airplanes is simply 'fixed-wing' -- usually at the end of a question, such as "You're already a pilot? Fixed wing?" A short pause, then cue the mildly bored look. Sorry, but They're Just Not Really Interested. (tm) You won't get kicked out of the saloon for wearing a fixed-wing badge, but you won't have a seat saved at the bar, either. "Here in this movie-theatre bubble, we are simply manipulating the 3-D world around us with our flight controls. I feel disconnected." From my skewed perspective, the idea of being able to fly these ungainly machines without the benefit of understanding 'basic aerodynamics' seems, well, weird. This is not how airplanes fly. But I forget that this is simply a different world from the one I inhabit, and that the Newton and Bernoulli have exactly the same influence on helicopters as they do on airplanes. We climb to our maximum maneuvering altitude of 500 AGL and head southwest to the practice area. Here on the space coast, everything is a hop, skip and jump away from the Kennedy Space Center. The ocean view is dominated by the huge Vehicle Assembly Building. You'd need to be standing right in front of this massive structure to fully comprehend its size; it covers more than 8 acres of floorspace alone. It's been a Florida landmark since the sixties; up to four Saturn V rockets could be kept within its voluminous confines. As we make gentle turns, climbs, and ascents, it drifts by like giant floating downstream. 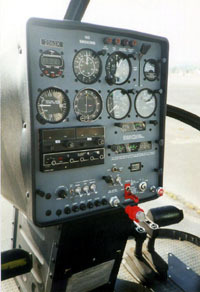 Panel view. With the exception of the RPM gauge, which features both rotor and engine RPM needles, the instruments are identical to a light fixed-wing aircraft. This helicopter is VFR-only. One by one, Andrew gives me the flight controls. It's like learning to fly all over again. The cyclic, which changes the angle of the blades individually to control pitch and roll, is controlled by the 'stick' in my right hand. The collective is a lever located to my left; it looks like, and operates similarly to, a parking brake. It controls the pitch of all the blades simultaneously, resulting in a climb. Anti-torque pedals on the floor control the amount of thrust generated by the tail rotor. After demonstrating the ability to handle the individual controls, I end up getting the full shebang. "Your controls," Andrew tells me. "You have the cyclic, collective, and the pedals." Andrew is smart; he may have given the controls to me, but his hands and feet don't leave their engaged positions. So sensitive! Tiny movements cause shifts in momentum which accelerate rapidly. We try maintaining level flight, followed by turns, climbs and descents. The picture begins to form: in the same way a constant speed propeller adjusts to overspeed and underspeed conditions to maintain RPM, the pilot must become a human governor of his helicopter's engine via the collective and throttle controls. Engine and rotor RPM must coexist in a small green arc located on the RPM gauge; if the RPM runs a little high, pull back on the collective or 'roll off' a little throttle. If the pilot increases the collective, the ship will want to climb. To prevent that and maintain altitude, forward cyclic pressure will have to be applied to drop the nose and convert more of the energy to forward motion. This, of course, results in an increase of speed. Back to step one. All interconnected. One configuration change requires 10 other small, almost imperceptible changes to counteract any unwanted effects. Some say the helicopter is thousands of parts flying in close formation; if so, the pilot plays the role of the conductor, making those parts fly together in harmony to produce controlled flight.